On November 18th, the 3.0.1 version of ESI was released and I wanted to write a quick post about what’s new. Even though numbering-wise this is referred to as a minor release, it is a very important one for those using (or want to use) the VMAX-related PowerShell cmdlets that are provided with ESI. Recently I had a partner/customer who was migrating a lot of SAP data from one VMAX to another VMAX and they ran into an issue they weren’t sure how to solve, well at least what the best way to solve it was. This person had a ton of data on the VMAX and more than a few TimeFinder/VP Snap point-in-time copies of each SAP volume that they used for testing/recovery or backup. For those of you unfamiliar with VP Snap it is a rather new (introduced with 5876) method of local replication on the VMAX that leverages the space-efficiency benefits of TimeFinder/Snap but also offers the flexibility of configuration provided by TimeFinder/Clone. 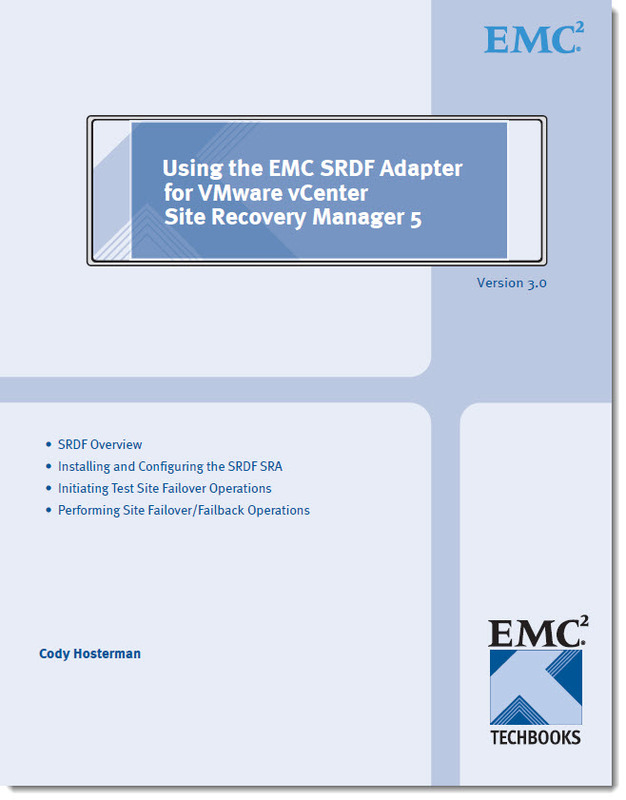 Quick overview, the SRDF Storage Replication Adapter for VMware SRM TechBook is an in-depth implementation guide focused on how to install, configure and manager SRDF with VMware’s vCenter Site Recovery Manager product. Overview of SRDF, the involved tools and how to perform test recovery, migrations and disaster recovery failovers. My last hurrah with this TechBook! Since I have moved on to a new (and exciting!) role within the Open Innovation Lab in the EMC Office of the CTO it is time for me to pass on the torch of the SRM TechBook.